[Compatible with Samsung Galaxy Note 8 ONLY] PREMIUM PROTECTION - featuring two layers of protection: a shock-absorbing [TPU] frame that protects against drops, and a solid [PC] back plate that protects against scrapes, bumps and more. ULTRA CLEAR - slim, transparent protective case body reveals and enhances the original beauty of the Samsung Galaxy Note 8. AIR HYBRID TECHNOLOGY - composed of two layers, a shock absorbing soft [TPU] frame for all around four corner protection and a hard [PC] back panel that is scratch resistant. SCREEN & CAMERA PROTECTION: raised edges 1.2mm higher than screen and 0.7mm higher than camera protect your screen and camera from dropping when placed face down. Elegance in a slim and protective design. This case combines style and protection making it perfect for everyday use. Designed with Air Hybrid technology, this case is composed of two layers; a shock absorbing soft TPU frame and a scratch resistant hard PC (polycarbonate) back panel to protect your device from drops and bumps. The raised lip also protects the screen from face down damage giving extra all around protection. For added protection and functionality, this case has tactile button covers to keep dust and dirt out as well as precise cutouts for all ports and camera. 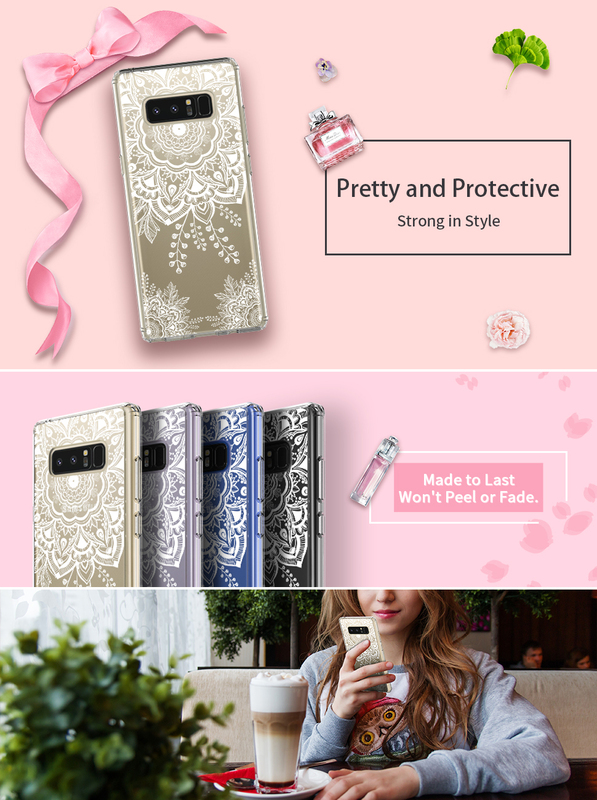 This slim and lightweight case compliments your device without completely covering it up with its elegant flower pattern design. The design is printed on the inside with odorless, scratch resistant ink that is long lasting and won’t fade, smear, or peel. This lightweight, no bulk case is just the right mix of style and protection for those who don’t want to sacrifice style for protection.